It’s OK, minions of the Carmarthenshire County Council damage limitation department, you can stand down – this one isn’t about you. A reblog of one of my old posts (from July 2012) this week because of pressure of work, but I hope it’s one that will appeal to both my followers who are into maritime history and those who have started following this blog recently because of the Carmarthenshire archives situation. Since I originally posted this, I’ve received more information about Lieutenant William Williams from Brian Vale, the acknowledged authority on Britons serving in early 19th century South American navies, and this appears as an additional section at the end of the post. I’m currently in west Wales, and over the weekend I revisited the glorious old St Ishmael’s church (above), overlooking the Tywi estuary. This is a very special place. The church overlooks the site of a lost village now largely swept away by the sea (perhaps in the great flood of 1607). More personally, ancestors on my mother’s side were being christened, married and buried there from at least the middle of the sixteenth century (probably long before, as this branch of the family was in the area from the fourteenth), and my cousin’s family, who live a few hundred yards down the road from it, still worship there. But St Ishmael’s also has one particularly interesting grave. This is that of Hugh Williams, a prominent Carmarthen lawyer who supported the Chartists and was rumoured to have been the secret leader of the ‘Rebecca Riots’ in west Wales in the 1840s. Williams, a close ally of the radical leaders Cobden and Bright, also went to America in the 1850s and was involved in some business transactions with an obscure lawyer who became a friend: the lawyer’s name was Abraham Lincoln. Lieutenant Wm. 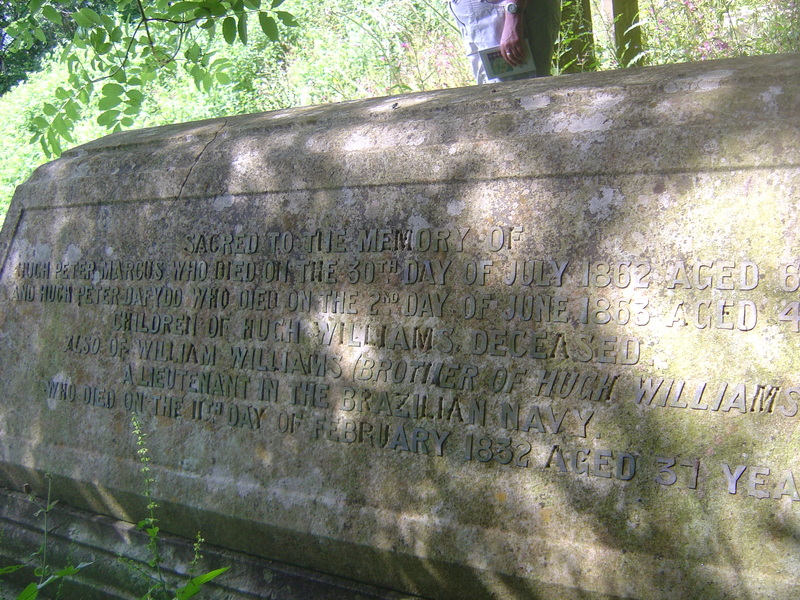 Williams, of the Brazilian Naval Service, died at Carmarthen, and was interred at St. Ishmael’s, on Carmarthen Bay, being the most convenient spot for carrying into effect his dying request, to be buried as near as possible to that element to which he had from early life devoted his existence. The kind – the faithful friend? As die the good and brave. The brave one from his bed. This is a treacherous, storm-wracked coast (it’s certainly lived up to that reputation during the last few days! 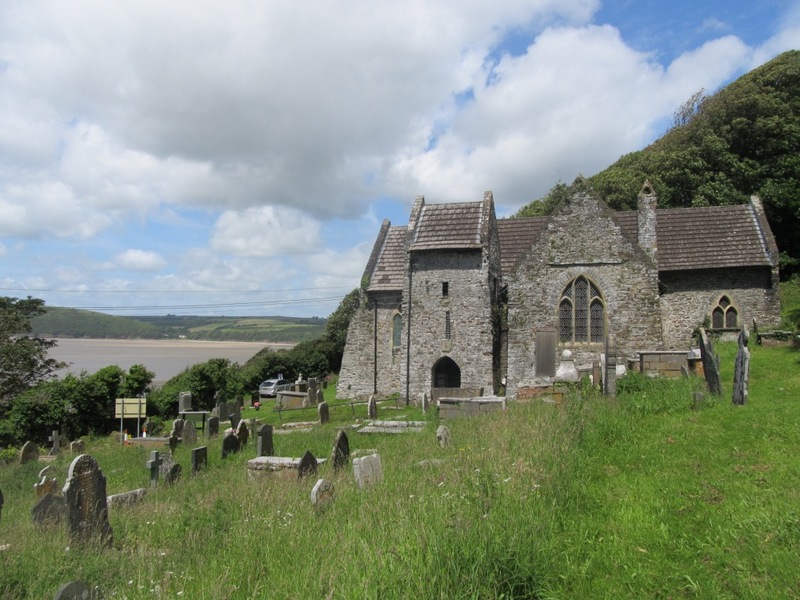 ), and just across the estuary from St Ishmael’s lies the village of Llansteffan, nestling in the hollow beneath the walls of a Norman castle built to protect the estuary that led to Carmarthen, the seat of royal power in south Wales. 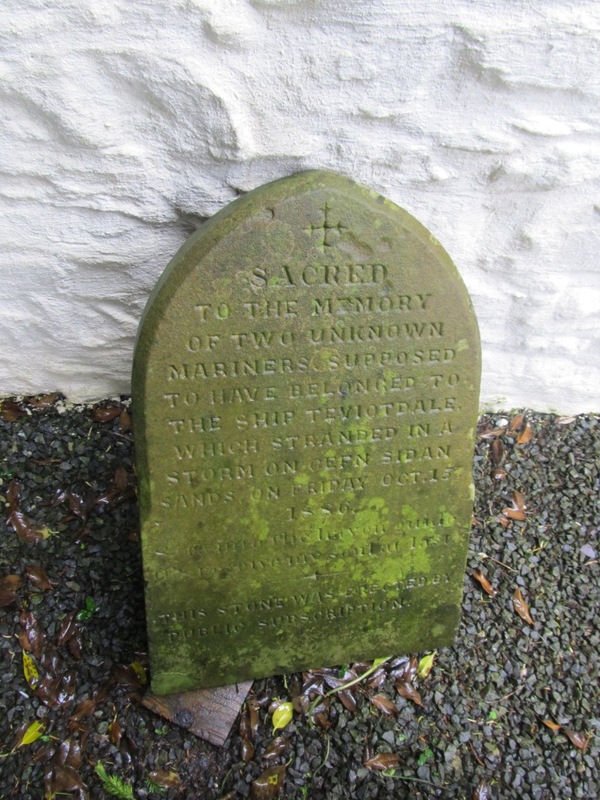 In the churchyard, almost hidden behind the gravestone of ‘Richard Moris, mariner’ of St Ishmael (who died in 1728, aged 82), is a small memorial to two men lost in 1886 when the Teviotdale was wrecked on Cefn Sidan beach, which has clearly been moved from its original position and is now sadly neglected. For centuries, Cefn Sidan (pronounced Kev’n Sheedan) was a notorious graveyard of shipping; the young niece of Napoleon’s Empress Josephine perished there in 1828, and there were persistent local legends to the effect that at least some of the wrecks were induced by gangs of ‘wreckers’ setting false lights. Several of the wrecks, including that of the Teviotdale, are still clearly visible. 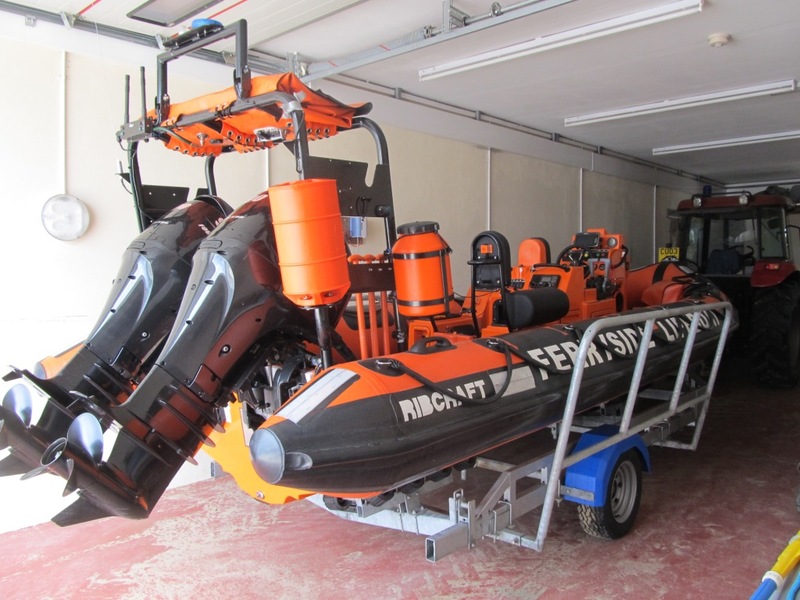 The dangers of these waters led to the establishment of a lifeboat station at Ferryside in 1835, and at the weekend I was privileged to be given a tour of the new station and a close-up look at the crew’s wonderful new boat. Many thanks to Terry and Matt, and it’s good to know that old Lieutenant William Williams can rest easy knowing that the coast which his grave overlooks is looked after so well! Recruited in London. Appointed as Volunteer on arrival in Rio 26 May 1823. Served on Cochrane’s flagship Pedro I (74) at the Blockade of Bahia and the capture of S Luis of Maranhão June-Aug 1823. Prize master of the Ventura Feliz. Sub-lieut 22 Jan 1824; appointed to the frigate Paraguassú during the suppression of the rebellion in Pernambuco. Served on the frigate Niterói and Pedro I 1825. To River Plate on the outbreak of war with Buenos Aires. Lieutenant on brig Caboclo under Commander John Pasco Grenfell 1826. Commander 12 Oct 1827. O/c Constança schooner at the Plate 1828 enforcing the blockade. Assisted in the capture of the Argentine privateer General Branzden. Not on 1832 List.